Belyn Hlaalu is a Dunmer farmer living in his house in Windhelm. 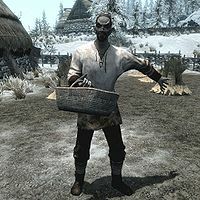 He is also the owner of Hlaalu Farm, a small wheat farm just outside the city walls that he runs with his employee, Adisla. He will pay you 5 gold for any wheat you might have harvested. Belyn wakes up at 7am and stays in his house for three hours to enjoy his breakfast. At 10am he heads down to the Hlaalu Farm to oversee its functioning and help Adisla get some work done. At 6pm Belyn leaves the farm and visits the New Gnisis Cornerclub where he eats his dinner until 10pm when he heads home to his bed. His outfit consists of a set of miner's clothes and boots. Belyn carries around the key to his house, along with a selection of common items and gold. He is very proud of his farm and gladly shares his philosophy, saying, "The best way for us to win the Nords' respect is through hard work." He also comments that the other dark elves in Windhelm complain too much: "Too many dark elves in Windhelm complain about the way we're treated. What good does complaining do?" Lastly, he may say, "I'm proud of my farm. It takes no small effort to grow crops in this part of Skyrim." 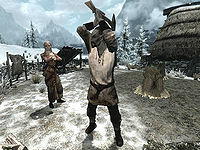 Adisla will also make mention of her age impeding her ability to work the farm: "Starting to get too old to work all day, but hopefully Master Hlaalu will let me slow down a bit." According to Dunmer of Skyrim, he is a descendant of the Dunmer House Hlaalu. He shares a surname with Niluva Hlaalu in Riften. There is nothing to suggest they know of each other or are related. This page was last modified on 25 February 2014, at 06:32.